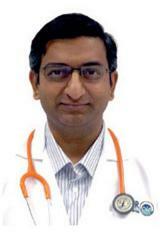 Dr. Kaiser Raja has more than 12 years of experience post MD. Dr.Kaiser Raja is a Visiting Consultant at Aster Clinic, Hamdan St, AUH. He is a Senior Consultant in Hepatology and Liver Transplantation associated with the Aster Integrated Liver Care Program at Aster CMI Hospital, Bangalore, Aster Medcity, Kochi and Aster Hospital Mankhool. A Hepatologist with more than 15 years of experience to his credit, Dr. Kaiser Raja is an expert in the medical management of patients with the complex liver disease, liver failure, liver cancer and patients requiring liver transplantation. Trained at some of finest institutes in the United States as well as India, his fields of special interest include chronic viral hepatitis, autoimmune hepatitis, and metabolic liver disease. Dr. Raja holds a major interest in the management of patients with chronic hepatitis B and C, autoimmune hepatitis, cirrhosis, liver cancer and post liver transplant patients. Dr. Raja has published in leading medical journals and is a regularly invited speaker for major national and international medical conferences. Apart from Aster CMI Hospital, Bangalore, Dr. Raja has a regular monthly liver clinic in Indore in Madhya Pradesh and in Abu Dhabi and Dubai in UAE.